CAIRO – 6 January 2018: Ahmed Ali, official of Egypt’s press office of the State Information Service, announced that the famous French director Olivier Lemaitre directed a documentary about ancient Nubian temples. The documentary highlights the stages of building the High Dam and the 50th anniversary of saving Abu Simbel Temple from drowning. The documentary’s last scene was shot inside Nasser Lake to show Nubian artifacts that were saved from drowning, such as the Nubian museum and the temple of Kalabsha. Ali added that the documentary is expected to be screened on French TV in the coming period. He pointed out that Lemaitre will shoot part two of the documentary next February. The director of the film is currently coordinating with international media production companies to produce the film. Lemaitre is seeking as well to create a partnership with the Egyptian television or the Ministry of Culture to produce this huge work because it promotes Egypt’s tourism industry. At the entrance of the Abu Simbel temple, there are two seated statues of the Pharaoh, showing the ruler with a short kilt, a beautiful headdress which is a double crown with a cobra and a false beard. Next to the statues’ legs, are smaller statues of the Pharaoh’s relatives. At the top of the temple is a row of 22 squatting baboon statues. The baboon’s cry was believed to welcome the rising sun. Ramses II built this temple to impress Egypt's southern neighbors, and also to reinforce the status of the Egyptian religion in the region. Abu Simbel was one of six rock temples erected in Nubia during the ruling period of Ramses II and its construction took 20 years from 1264 BC to 1244 BC . UNESCO considers Abu Simbel Temple one of the historical and monumental places that has to be protected against floods. CAIRO – 6 January 2018: Prominent archaeologist and author, Enas el-Shafie, traced the origins of Ancient Egyptian history in a TV interview with Ibrahim Hegazy, aired on state-owned TV on January 1. El-Shafie introduced evidence to illustrate how world literature was inspired by Ancient Egyptian heritage, including the stories of Snow White and Cinderella, and narrative poems, like the Divine Comedy and the Iliad. She initiated her talk by stressing the importance of ancient Egyptian manuscripts and how they provide archaeologists with important information about the era. “Al-Malah El-Taaeh” or “Al-Malah El-Ghareeq” (The Tale of the Shipwrecked Sailor) is a Middle Kingdom story of an Ancient Egyptian voyage. “It formed the early origins of “Alf Leila Wi Leila” (One Thousand and One Nights)”, according to el-Shafie. She explained that “One Thousand and One Nights” consists of a series of stories narrated by Scheherazade to her husband, Shahryar, with the aim of reshaping his thoughts. Shahryar was known for his violence against women, every night he got married to a new woman and then killed her on the same night, so Scheherazade decided to marry Shahryar to set an end to his conflict against women. El-Shafie explained, “The Tale of the Shipwrecked Sailor” was narrated by young sailors who wanted to ease the fear of Royal Navy Leader after his failure in one mission assigned by the king. The plot revolves around an Egyptian sailor survived from sinking after the sea threw him on an unknown inhabited island that full of trees, and plants. Shortly after, the hero faces a huge snake who predicts that the sailor will return safely to his homelands. Shafie also referred to a highly allegorical and symbolic story named “El Aafreet” (The Ghost). It revolves around a ghost of a military leader appeared to one of the priests, and he complained that his tomb was destroyed and harmed a lot so he asked the priest to reconstruct the tomb with high quality wood, and stones. The tale can be compared with “Aladin” and his genie from the lamp. According to Shafie, the story expresses the relation between the priests and the Egyptian army in 20th Dynasty time. One of the most interesting surprises in the episode was the relation between “Snow White and Seven Dwarfs” and ancient Egyptian history. Shafie clarified that the choice of number seven is taken from “Isis and Osiris” religious myth. One of the myth chapters is “Isis and the Seven Scorpions” She was protected and helped by seven scorpions while her attempts to survive and hide from Set. Ancient Egyptian literature also introduced to the humanity the early spiritual journey of the soul to the other side after death, also Ancient Egyptian literature narrated many after life events such as judgment, heaven, punishment etc, which have been intrinsic parts of many religious texts and in turn inspired Dante Alighieri who composed the epic “The Divine Comedy”. L'Égypte est un pays qui prend un nouveau départ. Boudée par les touristes pendant six ans, l'Égypte retrouve aujourd'hui des couleurs et il faut dire qu'elle a des arguments : le soleil, la mer, le désert. Le défi est de taille : redonner confiance aux touristes étrangers et les convaincre que la sécurité est devenue ici la priorité. Pour des vacances d'une semaine en Égypte, cette famille a choisi la mer Rouge. CAIRO – 4 January 2018: The Repatriation Department of the Ministry of Antiquities announced that Egypt restored three parts of different dismembered ancient Egyptian mummies after U.S investigators confiscated the contraband. 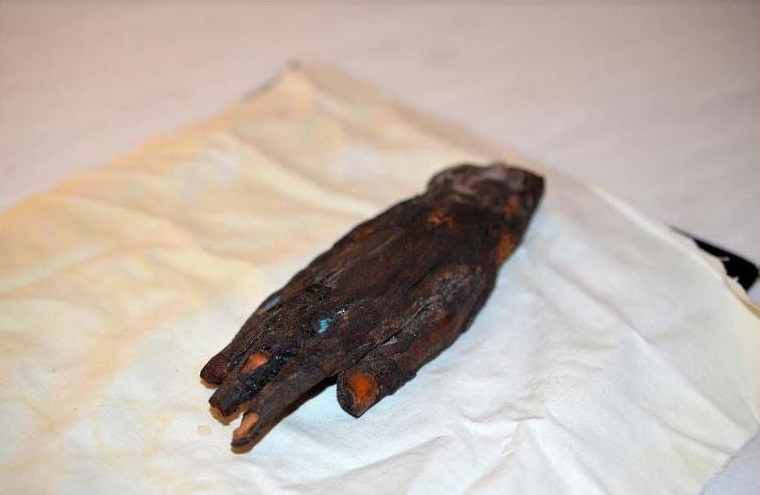 The parts include a skull, and two hands, according to a press statement released by the Ministry of Antiquities. In Manhattan, U.S. police managed to prevent an American dealer from selling the mentioned mummified parts, according to a statement by the Ministry of Antiquities. Shaa’ban Abdel Gawad, the director of the Repatriation Department, stated that the parts were stolen and smuggled illegally to the U.S. 90 years ago. “In 1927, an American tourist bought those parts from a number of workers after doing illegal excavation works at an archaeological site located in Valley of Kings, Luxor city,” he added. Egypt managed to restore the mummified parts after successful cooperation between the Egyptian Ministry of Foreign Affairs and U.S. Law Enforcement. 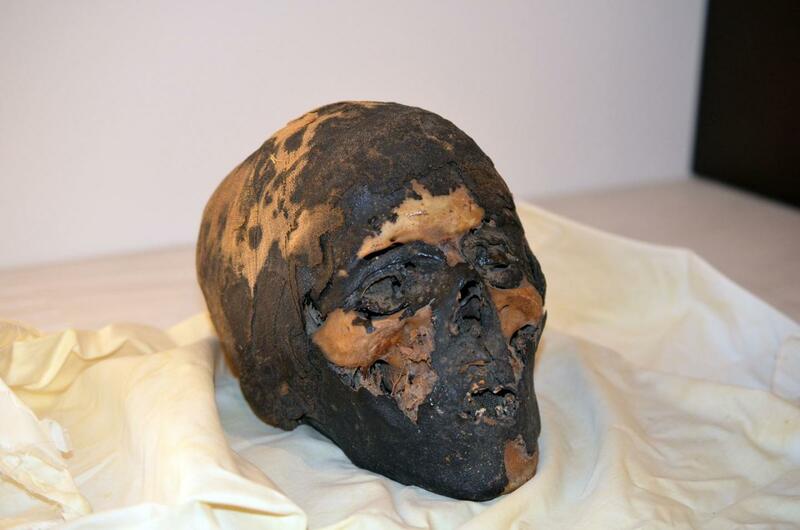 In addition, he calls for the prevention of putting Egyptian mummies up for auctions such as the Heritage Auction. Finally, Shamaa’ praised the efforts exerted by the Ministry of Antiquities’ Repatriation Department in 2018, stressing that the Repatriation Department was also successful in 2017. 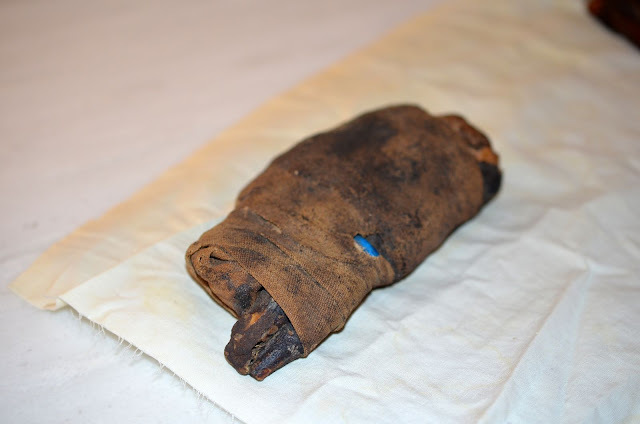 The Egyptian Ministry of Antiquities is set to recover from the US three fragments from three different mummies that had been stolen and smuggled out of Egypt in the early 20th century. Shaaban Abdel-Gawad, supervisor-general of the ministry’s Repatriation Department, told Ahram Online that the fragments were seized in Manhattan when their owner tried to sell them. Abdel-Gawad says that the fragments, which are in a very good conservation condition, consist of two hands and a head from three mummies. The fragments had been bought by an American citizen in 1927 from an antiquities worker who stole them from an illegal excavation at an archaeological site in the Valley of the Kings in Luxor. The ministry has authenticated the fragments, which are being recovered in accordance with Egyptian Antiquities law number 117/1983 and its amendment number 3 for 2010. “The fragments are now in the possession of American authorities, and will be handed over to the Egyptian embassy on 8 January at a large celebration in New York,” Abdel-Gawad said. CAIRO – 3 January 2018: Cairo governorate is expected to develop and renovate several historical areas and buildings in the capital as part of government plans to revamp old Cairo and preserve the country’s heritage, according to a released statement by Cairo Heritage Development Committee. Egyptian areas and buildings that are expected to be renovated include the historical hotel Cosmopolitan where around 60% of renovation works have been completed and a total of 28 old buildings that will be developed through funds provided by the National Bank of Egypt. Some of the stores and shops located in this area will be recreated into art galleries and libraries. Other old stores will be revamped into shops that sell antiquities and handmade crafts. The renovation projects conducted by the committee include developing photography centers, libraries, and video art galleries. The committee is also expected to introduce more cultural activities in downtown in efforts to meet the capital’s objectives in preserving heritage. Several suggestions have been tackled during the meetings of the committee including preserving the architectural upfront of Cairo’s buildings that portray the country’s political and cultural history. Other suggestions include holding an annual roaming art festival conducted by the capital that will take place in “Behler” alley located in downtown and is connecting Kasr El Nile Street with Talaat Harb Street. Some of the old coffee shops such as “La Pass” in Kasr El Nile Street will reopen, featuring book gatherings and operates as a place catering artists and cultural intellects. The committee is currently working on commencing projects developing Khedive Cairo. Cairo Heritage Development Committee has been established in 2016 and presided by Ibrahim Mehleb. CAIRO – 3 January 2018: Prominent archaeologist and author, Enas El Shafie, traced the origins of Ancient Egyptian history in a TV interview with Ibrahim Hegazy, aired on state-owned TV. El Shafie has introduced evidence to illustrate how world literature was inspired by Ancient Egyptian heritage, including the stories of Snow White and Cinderella, and narrative poems, like Divine Comedy and Iliad. El Shafie initiated her talk by stressing the importance of ancient Egyptian manuscripts and how they provide archaeologists with information about this important era. “Sinuhe” is considered one of the greatest pieces in Ancient Egyptian literature, according to El Shafie. She added that the story is a good example for democracy and mercy. The Story revolves around King Amenemhat I’s official called “Sinuhe”, who was connected to the king’s death. Sinuhe then fled to Palestine after King Senwosert I reached the throne. Through the story, Sinuhe expresses his feelings during his journey to Palestine, narrating the dangers he faced. Shortly, he manages to form great connections with the Palestinian tribes and he becomes the son-in-law of one of the greatest tribe leaders, Ammunenshi. Sinuhe, then, asked Egypt’s king to come back to Egypt to spend his final years, and the King accepts his request. According to El Shafie, the story of Sinuhe attracted the west. This led to the release of different adaptations of the story, such as American epic drama film “The Egyptian”, released in 1954. The film is based on the Finish best-selling novel “Snuhi, The Egyptian” written by Mika Waltari, and released in 1945. Another worldwide story that is adapted from Ancient Egyptian literature is “Cinderella”. It is originally inspired by the story of “Rhodopis”, according to El Shafei. Written in the first century B.C, it revolves around a beautiful girl whose mother gives her a closed box containing a pair of slippers. After her mother’s death, her father gets married to another women and she delivered two beautiful daughters. Rhodopis’ stepmother and half sisters oppress her. One day, Rhodopis seeks to discover the treasure of her mother’s box, and she finds the pair of slippers. While checking the slippers, a bird catches one slipper and throws it on the hands of a prince who happens to be on the lookout for his one true love. According to El Shafei, archaeologists do not know how the story ends. She also added that the prince sees Rhodopis in a vision, and she asks him to build her a pyramid. Greek historian Strabo mentioned in his Rhodopis version, that the prince manages to find Rhodopis, according to Greek archaeologist and researcher Joshua J. Mark’s article, published on Ancient History Encyclopedia. The post Neue Funde in der alten Hauptstadt Buto appeared first on selket.de.